The Montgomery County Planning Department is partnering with the office of County Councilmember Hans Reimer, and the Silver Spring Urban District to host three design workshops focused on placemaking strategies for Downtown Silver Spring. 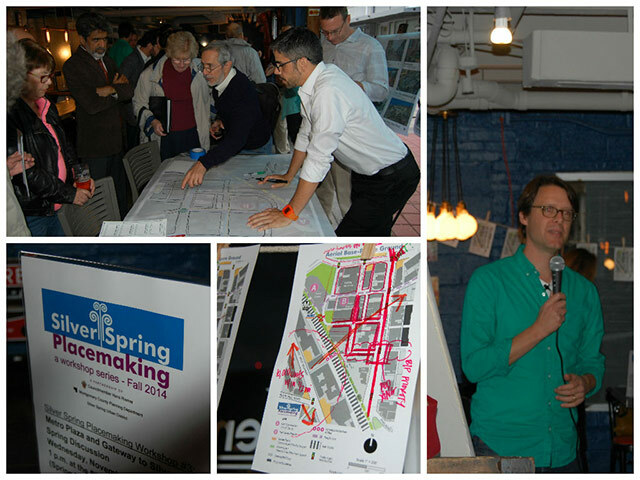 Review the Silver Spring Placemaking briefing (pdf, 4MB) to the Planning Board (1/15/15). Check out the video recapping the three Silver Spring Placemaking workshops produced and edited by Barbara Grunbaum and Mike Springirth of County Cable Montgomery (CCM). October 29, 5-7 p.m. at Denizens Brewing Co. The first workshop, held on October 15 from 7 to 9 p.m., at the Silver Spring Civic Building (1 Veterans Pl, Silver Spring, MD) explored the creation of civic space in the vicinity of the Transit Center. 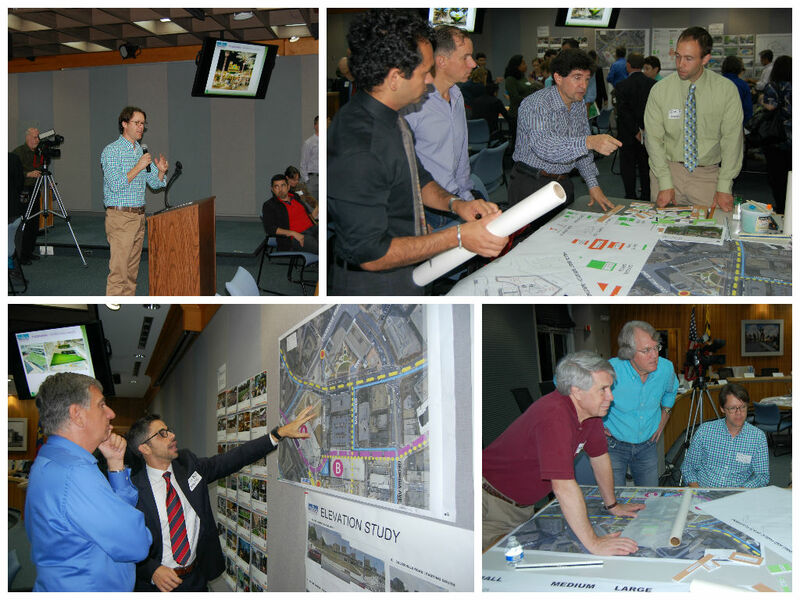 The session examined enhancements such as temporary short-term green space and bike facilities improving pedestrian experiences from the Transit Center to Downtown Silver Spring via Wayne Avenue. The second workshop, October 29, 5-7 p.m. at Denizens Brewing Co. (1115 East-West Hwy., Silver Spring, MD), focused on the community character of the Ripley District and the pedestrian experiences in the area to heighten community identity within the district. Creating a civic green space within the area was also considered. 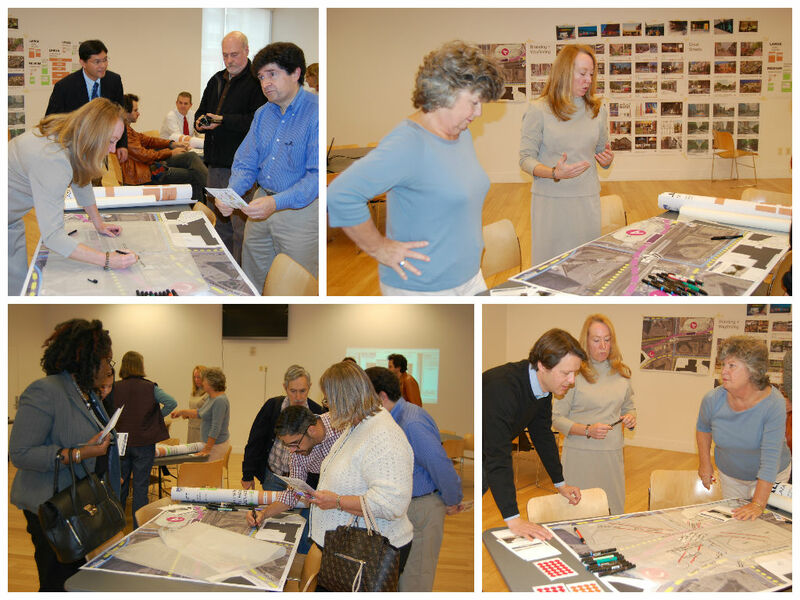 The third workshop, November 5, 11 a.m. to 1 p.m., (location to be announced), examined the areas immediately surrounding the proposed Purple Line station in Downtown Silver Spring. These areas are slated for high density development. Participants explored design options for the redevelopment of the Metro Plaza site (located on the northeast corner of East-West Highway and Colesville Road), a prominent gateway to Downtown Silver Spring from the District of Columbia. So that redevelopment can proceed in a manner best suited to this location, the workshop addressed transit support structures and streetscape enhancements aimed at improving pedestrian connectivity. New: Review the Placemaking Inspirational Images presentation produced by the Montgomery Planning Department.